1. How to Edit/Modify TSPSC details in online? 2.If if you forgot or lost TSPSC ID how to get it back or Recovery! Registration Form Available Who are already registered in TSPSC if you want to change any details on that data now you have a chance to edit our details and TPSC ID Modifications. As we know TSPSC provides a smooth and efficient functioning of the Government of Telangana by providing right candidates for various Government positions and advises them on various service matters like formulation of Recruitment Rules, transfers, and disciplinary actions, advise on promotions, etc. It has been launched One-time registration process to provide current vacancies information and to facilitate application process to the available posts. And is quite natural we need to update profile details, employment details, also there are chances of registering wrong details.Well now “Edit” option is available to update your profile, change your current profile professional or personal details also to fetch your reference ID. How to Restore or Recovery TSPSC Reference ID (One Time Registration Reference ID) if you lost? If in case of lost or forgot reference ID you have three ways to recover or restore TSPSC reference ID. You Need to create one-time registration once again with same details. you will not be able to create new registration number instead you will get a message saying that, you are already registered and your number will be displayed on the screen. Now TSPSC providing customer service and the service contact number is +9140 2312 0301. If you call on this number you will be asked your profiles details if given details matched with registered details they will provide your Reference ID. 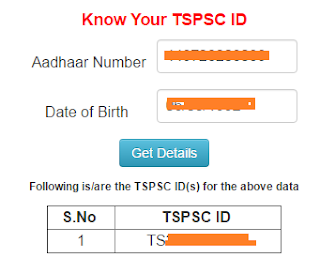 How to know your TSPSC Reference ID? Simple create new One time registration again. It will generate a message saying that, you are already registered and your number will be displayed on screen. How to update signature in TNPSC profile. I have missed signature. hi.. I lost my one time registration reference id number. How i should get back it. Please tell me an alternate method..
why dont you study once again??? how to change photo & sign tnpsc profile? This is harsha(TSPID:TS2200974378), We received payment gateway error, when we try to re-do the payment we are getting the following error. But i am sure i didn't pay the amount. How do i login again and payment? How can I edit once I have submitted the application form for Group -II exam. I have Wrongly Entered My name(TS2200919889). I have profile name password problems also in completed register error the I how to recovers? Already Submitted Application there is no chance to edit or update but you have a chance to update it at Document Verification Time. And you should edit "Non-Creamy Layer" in your TSPSC One Time Registration Online...After that you never repeat the above problem from next application otherwise same problem you will get.